6:30am: I usually wake up between 6:30am and 7am. I like to start my day slowly, so I stay in bed for a few minutes. Sometimes I take one last nap, sometimes I just think about the things I need to do during the day and try to organize my schedule mentally. 7:30am: I get changed and go out to walk my dog. It is my main form of exercise, it is when my dog gets to use all his energy, as he sleeps most of the day, and it is the time when I can speak to my family on the phone. I speak to my mother, my father and my sister almost daily, depending on who is available at the time of my walk. It is also when I get my Vitamin D, as I spend the rest of the day mostly indoors. I walk for one hour daily. The hills of San Francisco make it a very good exercise. 8:30am: I shower and sit at my desk to answer emails, work on my firm’s projects, talk to clients. This is the time I have to also prepare for classes, reply emails from students or other professors. I am the Graduate Thesis Coordinator at the Academy of Art University, so a lot of the work I do for school is administrating the thesis process. 11:00am: I have a late breakfast, usually a yogurt with fruits or a tapioca crepe with cheese. At this time I also prepare my lunch and get ready to go to school. I always take with me my computer, my chargers, a sketch paper and sometimes a book with a reference for a student, as well as my lunchbox and my water bottle. 12:00pm: I start my studio or thesis class. The first half always has a bit of a slow start, but once everyone is ready, it is rather intense, talking to each student individually, sketching over their drawings, testing with their models. 3:00pm: I walk with the Graduate Director, who co-teaches studio with me, to his office and we usually use the break to discuss course material, prepare lecture, grade or talk about bigger academic goals for the program. That is also when I have my lunch, usually a salad or a sandwich, something that does not require heating. Our break lasts for 50 minutes, then we are back in class for the second half of the afternoon. 6:30pm: Class is over and I take an Uber home. Many times before going home I do a quick stop at the supermarket. As soon as I am home, I check my emails to see if there is anything urgent with Rizoma’s projects. I then sit and work for as long as it takes. Some days there is no work, others there is a lot of work. It really depends on how many projects we have and what phase of designs we are at. Twice a week I have online meetings with my thesis students that are in our online program. We try to replicate as much as we can the onsite experience, so we do one-on-one meetings where we can sketch over their drawings, show precedents, talk about their models. When I have no work or no meetings, that’s when I go to the gym. I usually prefer classes than the lonely weight lifting. Zumba has been a favorite lately. 9:00pm: I start cooking dinner. 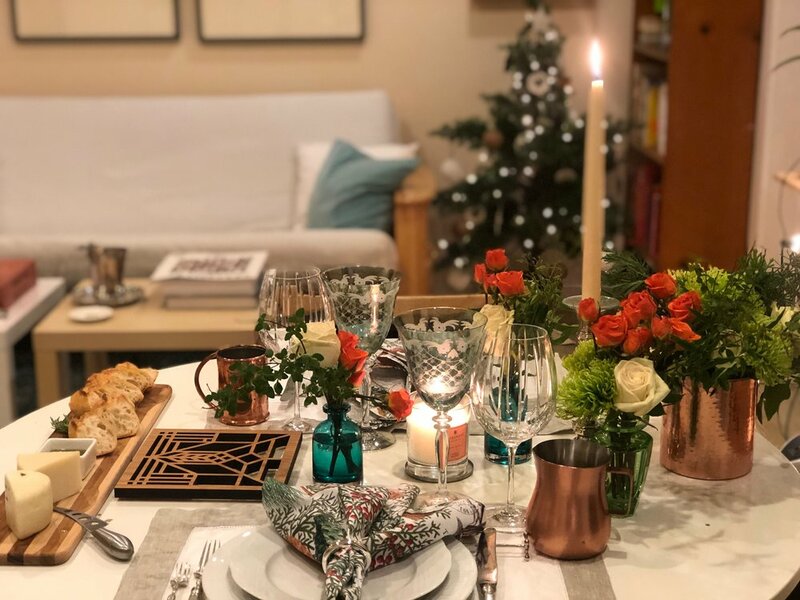 I really enjoy cooking and setting tables, so when I have time, my boyfriend comes over and we cook together and sit at the table always nicely set up with candles, flowers, a nice table cloth, fabric napkins and a good glass of wine. I always bring dinning accessories when I travel, whether it is a napkin ring, beautiful glasses, plates, flower vases, candleholders, cutlery, or anything else. I also don’t wait for a special occasion to use them. I like to eat in a pleasing atmosphere. Life is made of these small pleasures. My mother always says: “We need to have ‘poetry’ in our lives”. I believe that’s what she means, it’s the little things that we do to make our lives more gratifying, the beauty that we add to the otherwise colorless daily tasks. Back home in Brazil we always had meals sitting at the table together and it was the time we had to talk, to connect to each other, to enjoy a good homemade food. Even at weekdays, we managed to go home and eat lunch together. Having lunch at the desk is a big sacrifice to me, it takes away the pleasure of eating, so I try to make up for that at dinner time and on weekends. 10:30pm: I go to bed, set up my alarm clock for the following day and read a book or watch series or a movie in my computer. That helps me slow down before sleeping.